The whole B-complex family of vitamins – especially folic acid and vitamin B12 – are necessary for optimal health for you and your entire family. The B vitamins work together as a team, which is why it is generally recommended to take a supplement with the whole vitamin B-complex family, rather than individual, isolated B vitamins. High-energy, end-chain, living B-vitamins are derived from natural sources for high cellular resonance. With dramatic support for liver, energy, immune system, heart, brain, and mood balance, the whole B family is needed to help keep the body in balance and harmony for greater physical, emotional and mental health for you and your family. However, approximately 99% of all vitamin B products on the market today are synthetically made in a laboratory, typically synthesized from coal tar derivatives! These synthetic molecules mimic only one component of the multitude of life-supporting nutrient complexes found in real, natural B vitamins. Research suggests that natural sources of B vitamins are safest and most effective especially in long term use. 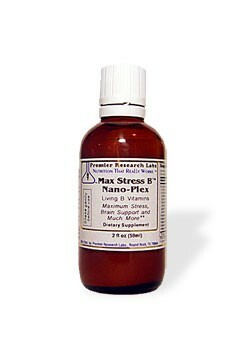 Completely natural-source B vitamins are available in Max Stress B Nano-Plex derived from proprietary technology using special, healthy probiotic strains. This means a Quantum Leap in everything that B vitamins do for the body – maximum stress protection, anti-aging, instantaneous energy boost, brain rejuvenation, heart health, and mood balance. Because of its liquid oral delivery system, this is one product that literally everyone we know who tried it really felt an immediate difference – an instant feeling of well being and better mental clarity. No amount of synthetic B vitamins can deliver the super energy boost you will experience with just 1/2 teaspoon of Max Stress B Nano-Plex. Primary Saccharomyces Cerevisiae, Bifidobacterium Species (breve ss.breve, infantis ss. infantis, longum), Enterococcus Species faecais TH10, faecium), Lactobacillus Species (acidophilus, bulgaricus, casei ss. casei, fermentum, helveticus ss. jagurti, plantarum),Streptococcus Therm. Adults and children (age 4 and up): Take 1/2 teaspoon mixed with 1/4 cup water of juice, 1 to 2 times daily.